That’s how long it has been since Humboldt State University David Josiah Lawson was murdered at the age of 19 at an off-campus party near the school. Almost two years later, his family, along with California State University students and faculty, are still fighting for justice for his unsolved murder. 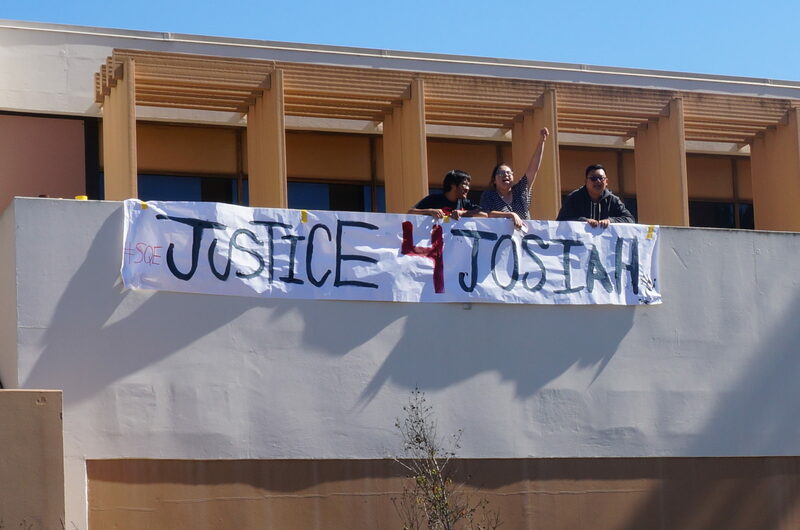 “Once we heard about Josiah, we felt like this is wrong and why aren’t we doing anything about it?” said Kathryn Romo, communications major and California State University, Dominguez Hills’ Students for Quality Education facilitator. Lawson was a sophomore majoring in criminology and justice studies. According to the California Faculty Association, Lawson wanted to become a lawyer once he finished his education and was the president of Brothers United, a student organization at HSU that formed after Corey Clark, an HSU student, was murdered in 2001. That case is still unsolved, but Lawson’s death sparked the creation of an organization devoted to supporting black men at the university. Lawson was one of those men. As reported by Mad River Union, a local newspaper, on April 15, 2017, around 2 a.m. while at a party in Arcata, California attended by about 100 people, a young woman lost her cell phone and accused a black student of stealing it; the accused was Lawson’s girlfriend. A fight broke out and Lawson’s girlfriend was stabbed twice in the arm and Lawson was fatally stabbed, dying later in a local hospital. Kyle Zoellner, 23, was arrested at the party and charged with the murder. Zoellner had admitted to being in a fight with Lawson but pled not guilty to the murder charge. After five days of court hearings and testimonies from 17 witnesses, a judge found that there was insufficient evidence and acquitted Zoellner. Due to the case’s current unsolved status, California State University students across the state, along with the CFA, have banded together to push for some kind of resolution. In Feb. 2018, Courtney Wagner, a now alumna from Sacramento State University, released a documentary she and three other students made about Josiah’s story. During the week of events last month, SQE students at Humboldt State University held a banner drop to start the week of action. CSUDH followed suit by holding their own banner drop on Oct. 17. Other events included a teach-in with the Black Student Union at Cal Poly Pomona, a screening and discussion of a documentary about Lawson at Sacramento State and more. At the CSUDH SQE banner drop, Romo read a short speech she had put together and finished the banner drop with another call and response. The California Faculty Association has joined students in the fight for justice and change. The CFA is an active participant in social justice, Villanueva said. She feels that advocating for issues like this are a part of their work as faculty members. As reported by The Bulletin in Sept., the CFA places partial blame for Josiah’s murder on systemic racism and police incompetence. Justice for Josiah is about more than the unsolved case, it’s about the safety of students at CSU campuses, Romo said. Since Lawson’s death, HSU students have held several forums and demonstrations urging the HSU administration to get involved in issues surrounding campus safety, lack of student housing and other issues. The case has remained unsolved since Zoellner’s acquittal and Lawson’s mother, Michelle-Charmaine Lawson, is currently offering a $55,000 reward for anyone who can offer information relating to her son’s death. *This story was originally published in the Nov. 7 issue.